It’s hard to deny the worldwide phenomenon that is this movie. While I’m sure parents now twitch any time “Let it Go” comes on, the fact of the matter is many factors led to the success of this film. Starting in the mid-2000’s, Disney saw they had a problem and set about trying to fix it. By rehauling how they told stories, and how they approached the characters in these stories, they soon were back on top of the animation industry (while Pixar continues to be content pumping out Cars sequels). Stunning visuals can only get you so far in a Disney movie, and Frozen (2013) certainly takes the cake when it comes to visualizing snow and ice through computers. What makes Frozen work as a story is its complexity. No one character is completely good or completely bad, each having their faults and limitations, as well as their good intentions and personal desires. This makes identifying the villain a little bit like it is in real life: is it Elsa, who accidentally turned the weather to winter and is fighting to maintain her freeing isolation? Or is it Hans, who probably has a disadvantage at home and just wants to bring his leadership to his kingdom? Either way, the moral of “sacrificial love” is one that breaks from the standard “fairy tale” storyline. I think what sets Frozen apart is its music. Sure, most Disney films are considered “musical,” but it’s the Broadway-esque styling of the songs that makes them so memorable. And while the songs are heavily weighted to the first half of the movie, the certainly run the gamut of emotions. From sappy love songs to a goofy snowman aria to the ballad of an independent woman, almost every character gets their say through song. Still, Disney missed a few opportunities to incorporate Foreigner songs into the soundtrack (i.e. “Cold as Ice” and “I Wanna Know What Love is”). 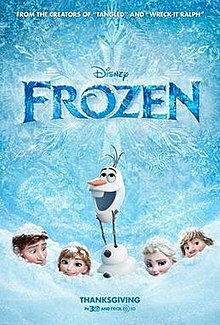 A fantastic movie, when compared to other animated films, I give Frozen 4.0 stars out of 5.